Hoverboards ruined Christmas, burst into flames, look foolish, are widely banned, and don’t hover. Lame all around. Except when you turn one of them into a famous magical item from one of the world’s most beloved anime series. 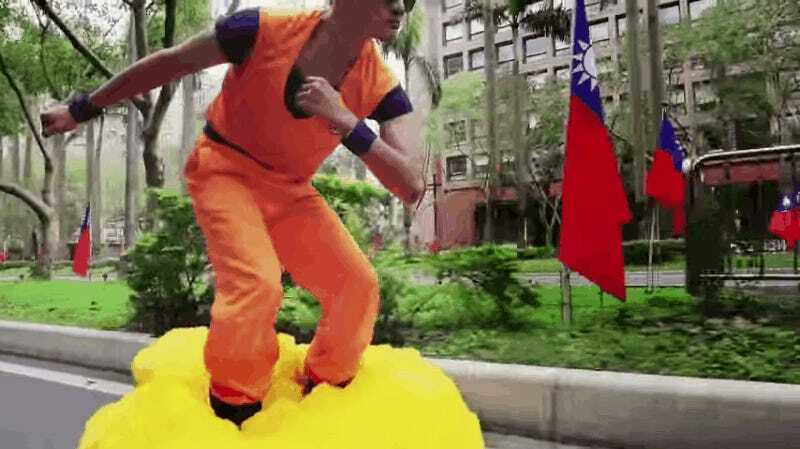 That’s what this guy did when he dressed up as Goku from Dragon Ball and motored around Taipei on a homemade cloud. Videos recently surfaced on the internet of this Dragon Ball fan, who modded a run-of-the-mill hoverboard into the Flying Nimbus, the cloud Goku flies around on like a magic carpet in the cartoon. The Taiwan-based performer is known as Yes Ranger, and his YouTube account is full of Power Rangers and League of Legends brought to life. It’s not the first hoverboard-turned-Nimbus we’ve seen anime fans gin up, but throwing on shades and taking it out onto public streets with an IDGAF attitude (except when fist-bumping small awe-struck children) is pretty badass. Almost as badass as figure skating to the Cowboy Bebop theme song dressed as Spike. And if you’re wondering how he morphed a hoverboard into a cool anime prop, here’s a video how-to. My question is... isn’t styrofoam flammable? Goku’s a Super Saiyan though, so I’m sure escaping a flaming half-Segway would be cake.